Pop Goes The Movies: FLASH GORDON | Warped Factor - Words in the Key of Geek. Tie your mother down & snuggle up with a fat bottomed girl, if you like, as we take a look back at Queen's score for Flash Gordon, the 1980 release which saw them make inroads into the world of film. "The band was first approached in 1979, and as writing film music was something they had all thought about but had not yet got around to, their Manager arranged a meeting with De Laurentiis and mentioned Queen’s interest in scoring the film. Rumour has it that De Laurentiis’ first reaction was simply, “Who are the Queens?” They were, as it turned out, the first rock band he had ever listened to, and the outcome was that the band was commissioned to write the music for the movie." Drummer Roger Taylor was attracted by a sense of old-time science fiction! “We’ve been offered quite a few films, but Flash Gordon was something which Brian [May] and I were quite attracted to because of its sci-fi thirties connotations." What also proves interesting is to look at where Roger, Brian, John Deacon and Freddie Mercury were as a band at the time they were approached to record for Flash Gordon. "That Queen record came about because that Queen bass player... spent some time hanging out with us at our studio." Going on to sell over 7 million records worldwide, Another One Bites The Dust is Queen's best selling single (beating Bohemian Rhapsody by a cool half a million), making it no surprise that the group decided to stick with a similar dance-tinged flavour when recording the follow up album to their first foray into film soundtrack, 1984's Hot Space. So as work began on Flash Gordon, disco, funk, and rhythm and blues were just as much at the forefront for the band as their traditional rock style, and during the soundtrack recording sessions the group continued to make extensive use of synthesisers, and add sampling to their repertoire. "...very good and over the top. We wanted to do something that was a real soundtrack. It’s a first in many ways, because a rock group has not done this type of thing before, or else it’s been toned down and they’ve been asked to write mushy background music. Whereas we were given the licence to do what we liked, as long as it complimented the picture." And compliment the picture it did! 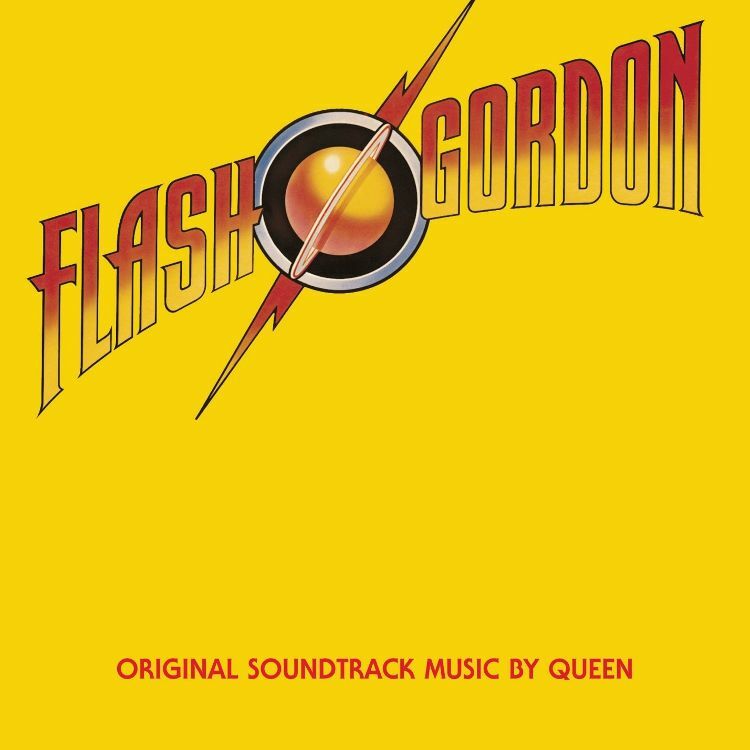 The remainder of the soundtrack was recorded from October through November 1980, with all but two of the tracks (Flash's Theme and The Hero) being instrumentals, although most feature dialogue sampled from the film. An idea the group came up with, as Roger Taylor explained. Side A of the album contains mostly synthesiser, vocal, guitar and drum soundscapes (accompanied by the movie dialogue samples), whereas Side B starts with similar compositions but develops for the most part around the full-band rockier themes. The last track, The Hero, while an individual song, reprises both motifs, with different takes of the song used for the end credits in the film and for the album finale. The movie debuted in December 1980, two weeks after the single Flash was released. The 7" cut being a new edit of the album version (Flash's Theme) featuring dialogue taken from various parts of the movie, most memorably, Brian Blessed's character exclaiming "Gordon's alive?!" Sung as a duet between Freddie Mercury and Brian May, with Roger Taylor adding the high harmonies. May played all of the instruments except for the rhythm section. He used an Imperial Bösendorfer Grand Piano (with 97 keys instead of 88, having an extra octave on the low range), Oberheim OBX synth (which he plays in the video) and his homemade Red Special electric guitar. The single peaked at #10 on the UK chart, #42 on the U.S. Billboard Hot 100, #3 in Germany and #1 in Austria, and evidently rounded off an enjoyable experience for the awesome foursome of Freddie, Brian, John & Roger.